We’d love your help. Let us know what’s wrong with this preview of City of Torment by Bruce R. Cordell. Raidon Kane travels to the subterranean fortress of the somnambulant aboleths, bent on killing the Eldest in its sleep. But he isn't the only one bound for the hidden city. A warlock, an arch fey, a pirate, and a high priestess of the Abolethic Sovereignty all have designs of their o Lovecraftian horror from award-winning Forgotten Realms(R)game designer Bruce R. Cordell. Raidon Kane travels to the subterranean fortress of the somnambulant aboleths, bent on killing the Eldest in its sleep. But he isn't the only one bound for the hidden city. A warlock, an arch fey, a pirate, and a high priestess of the Abolethic Sovereignty all have designs of their own on the Eldest-if they don't kill each other first. To ask other readers questions about City of Torment, please sign up. Great book. Some very imaginative ways of travelling between planes. Angul is one of the most powerful weapons that I've ever read about. Krakens & aboleths are nasty enemies. Elder Gods ancients before world's birth, main characters descending into madness and the fantasy version of "Innsmouth Look": more lovecraftian themes in the second part of this high-fantasy trilogy. Very nice. The cliffhanger of book 1 is taken back up at the start and sets the stage for the reasons the story goes in the direction that it does. You find out much more of the origins of Japheth's pact. Seren's backstory is revealed. Captain Thoster has light shed on his hinted-at issues as well. All in all, The story continues to spin in interesting ways in the second book of this series. Character development and growth along with interrelationships were balanced well with action and plot progression. The cliffhanger of book 1 is taken back up at the start and sets the stage for the reasons the story goes in the direction that it does. You find out much more of the origins of Japheth's pact. Seren's backstory is revealed. Captain Thoster has light shed on his hinted-at issues as well. All in all, the characters of questionable character are shown to grown into likable (if still flawed) individuals. The story becomes more complex and remains interesting. The action and descriptiveness of the events are what we all want to see in our minds when we play a nice game of D&D. The ending is very much geared to hook you into picking up the next book in the series. I'm torn on that being good or bad, but since the series in general has been worthwhile reading, I'll defer to good. I will be reading on into book 3 of the series myself. After reading the first book in the series, Plague of Spells, I didn’t know what to make of the trilogy. There were some parts I liked in that book, but I still had a bad taste in my mouth. Did I want to get the next book, City of Torment? Or, was I just better off leaving it at that? Wizards of the Coast “forced” my hand, when I received a free copy of the book from them, having requested it after being informed that signed copies of The Ghost King had run out, with me having won a copy from th After reading the first book in the series, Plague of Spells, I didn’t know what to make of the trilogy. There were some parts I liked in that book, but I still had a bad taste in my mouth. Did I want to get the next book, City of Torment? Or, was I just better off leaving it at that? Wizards of the Coast “forced” my hand, when I received a free copy of the book from them, having requested it after being informed that signed copies of The Ghost King had run out, with me having won a copy from their The Ghost King Contest. With no other Forgotten Realms novels WotC was going to ship of any interest to me, I decided to continue this trilogy, free of charge. Having finished the novel, I am happy that I did not go out and pay $7.99 for it. I’ve read worse books, but, for the same amount of money, I could have gotten lunch from Chipotle, which would have left me with a much more satisfying feeling. Having read Bruce Cordell’s other novels, along with the Abolethic Sovereignty books that have already been published- and this might sound harsh- but I think Bruce is better off sticking with the stand alone, one-shot novels, rather than an entire series. As I’ve mentioned in the past, Bruce has an uncanny ability to create characters that, on the surface, pique my interest and seem interesting. Whether it be Merrik and Gungarri from the early days, or the more contemporary Raidon Kane and Kiril Duskmourn, there’s something about most that makes me want to learn more about them. They way Bruce’s novels have worked, there were only a few characters we’ve gotten to know better, with the “sidekicks” of past novels getting time to shine as protagonists as later novels. By and large, there hasn’t been all that much characterization and depth in stand alone novels, by virtue of having to introduce characters, plots, places, and adequately conclude all of the above. In City of Torment, Bruce has now had two books to give personality to his characters. In this matter, I am going to have to say that he’s failed, in some cases, worse than others. Let’s take The Lord of Bats, the enigmatic Archfey introduced in the first novel in the series. I liked the character when I first “met” him. Subsequent happenings in the book, coupled with how he was portrayed, have soured me to the character. I went from seeing him as a mysterious extraplanar creature to picturing him in my mind’s eye as looking like the Count, from Sesame Street. No joke. The characterization and personification that was injected in that character totally ruined it for me. Other characters, we get more of the same. Jasepth the warlock, he’s still, more or less, the typical “loner with dark, mysterious secrets and problems of his own in love with the pretty girl” archetype. Raidon Kane, we’ve known him for three books now, and his personality seems to be all over the place- and we’re none too much the wiser about what drives him (asides for his daughter), or other intimate details of his life. Mix in the generic “magician running from a past in which she was evil, but now she’s less so”, “mysterious antagonist who is more than meets the eye, who seems to command unmatched power, such that no one can/will beat her”, and “a shifty pirate who seems to be going along with everyone, but has a secret and agenda of his own”, and you’ve got yourself a cast! One of the things that bugged me- not to the point that it ruined my reading experience, but it was something that floated in the back of my mind- was the use of “4e keywords” all throughout the novel, as opposed to the “proper Forgotten Realms terms”. That is to say, Eladrin- that is, what we know as Sun/Moon/Star Elves- are called ‘Eladrin’. What we’ve always called the Material Plane, characters call ‘The World’. Undercommon has become ‘Deep Speech’. While the D&D rule set has changed, the Forgotten Realms is an independent entity, not necessarily beholden to what the rules dictate. While, as per the rules, ‘Undercommon’ is now ‘Deep Speech’, we’re not told of any changes in the Forgotten Realms, as to why the language that was referred to as ‘Undercommon’ is now “Deep Speech’. We are not told of any changes in the Forgotten Realms as to why ‘The Material Plane’, as it has always been known as, is now referred to as ‘The World’. The Elemental Chaos was also referenced, but since the Forgotten Realms has an explanation as to why A =/= B anymore, I don’t see any problems with this. The point of this specific schpiel is to highlight something that I asked Bruce Cordell specifically in action. While he responded that the Forgotten Realms would not “lose their identity” as novels (and/or sourcebooks) toed the 4e line, we have absolutely no mentions of Sun/Moon/Star Elves- these kinds of ‘Eladrin’ were specifically invoked in the book. City of Torment by Bruce R. Cordell- This is the second book in the Abolethic Sovereignty, with the first book called Plague of Spells and the third and final book called Key of Stars (due out in late 2010), all set in the Forgotten Realms universe. Bruce R. Cordell is the author of other Forgotten Realms novels and has contributed a few short stories to various anthologies. His other Forgotten Realms novels include; Stardeep (which is part of The Dungeon series of stand-alone novels), Darkvisio City of Torment by Bruce R. Cordell- This is the second book in the Abolethic Sovereignty, with the first book called Plague of Spells and the third and final book called Key of Stars (due out in late 2010), all set in the Forgotten Realms universe. Bruce R. Cordell is the author of other Forgotten Realms novels and has contributed a few short stories to various anthologies. His other Forgotten Realms novels include; Stardeep (which is part of The Dungeon series of stand-alone novels), Darkvision (which is part of The Wizards series of stand-alone novels), and Lady of Poison (which is part of The Priests series of stand-alone novels). Some characters from the novel Stardeep also appear in this trilogy. The story is continues from where the last book, Plague of Spells. A tenday has passed after the viscous fight against the kraken. We find Japheth taking over a gang of thugs to extort their 'profits' so he can find some way to free Anusha from the Dreamheart. During his efforts, Raidon Kane is hunting down Japheth for stealing the Dreamheart, with the crew of the Green Siren, the same crew as in the first book, helping him. The captain, Thoster, and the mage, Seren, are helping in the search. Then we find Anusha trapped in the aboleth city called Xxiphu in her 'dream-walk' state hoping to find a way out. As Japheth frees Anusha, she returns for a few minutes before being sucked back into Xxiphu, only this time she isn't trapped. Raidon and the others barge in of Japheth, forcing him to flee into the Feywild, where his patron, the Lord of Bats, who granted him is warlock powers, is trapped. Angry at being unable to catch Japheth, Raidon and the others decide to travel down into Xxiphu to stop a being called the Eldest, who is part of the Dreamheart, from reawakening. Japheth meanwhile, decides to free his patron under the promise to not harm him and to save Anusha from the aboleths. Anusha, after being sent back to Xxiphu, finds that another being, who is also an invisible 'dream-walker', became freed from her entrapment and they team up to find a way to leave the city, but will they be able to and how will the duo find a way to return to their bodies? Will Japheth rescue Anusha and fight off the Lord of Bats? Will Raidon, Captain Thoster, and Seren find and kill the Elder before it's to late? 1) Descriptions. I didn't really like the descriptions. They seemed too vague and not really defined. When trying to mentally picture the aboleths, it was hard at first. They are better described later in the story, when we see more and more of them. Also, the characters descriptions seemed a little lacking. I don't really know why but it seems that they are generally faceless characters. Finally, the backgrounds were horribly described. Everything was so alien and vague that what was given didn't make much sense. 2) Abolethic Sovereignty. For the trilogy being named the Abolethic Sovereignty, I still have no idea what exactly it is. What is said about it is horribly mangled in jargon and babble that I have really no idea what's being explained. All I know is that it has to do with the aboleths, the Elder, and the end of the world. That's really everything I could come up with. 1) Characters. The characters were just as good, if not better, than they were in Plague of Spells. Japheth had more depth added to him and it just made him a more likable character. Anusha, for all her blandness in lack of personality in the first book, gained a personality. Raidon, for the most part, stayed relatively the same. But the minor characters of the first book, Thoster and Seren, became more major characters. While in Plague of Spells, the two started to gain a bigger role in the last quarter of the book. In here, they become more prominent and are really great, wonderful character. Thoster is really likable with his carefree attitude. Seren is great because of her coldness and her past. Even the minor characters are great. The Lord of Bats is wonderfully vile and the eladrin Malyanna is just as twisted. It really seems that characters really improved greatly. 2) Flow. The story was an amazingly fast read. Due in most part to the characters and the fast paced story line. I just had a hard time putting the story done for to long. It felt almost like Japheth's itching hands when he hasn't taken is Traveler's Dust. I was just glued to everything. 3) Japheth Plot Line. I really enjoyed this plot a lot. The lengths he goes through to save Anusha was fun and exciting to read. I can't really say much about what makes it so great but I can say that (minor spoiler!) seeing him lose his powers and how helpless and useless he really is was really unexpected. It really just was an interesting, fun read. 1) References. There is some great references to other authors work in here that I really enjoyed. There is talk about The Haunted Lands trilogy written by Richard Lee Byers and how that effects a character was fairly enjoyable. 2) Stars. I'm really interested about the stars mentioned within the story. I can't say much, but it perked my interest and I do hope it's explored further in the next book. 3) Cover Art. I really enjoy this. I like the colors, the purples, black, and yellowish golds really catch you eyes. Also, there is a lot of subtle things in the background, with figures in the purple and the glowing sword the character is wielding. It's just interesting. Plus I know who is on the cover, which is definitely a plus. It's Anusha if you would like to know. Similar to the first book, some characters are interesting, mostly Japheth, the final fight was rather unrealistic....the story is not that bad. 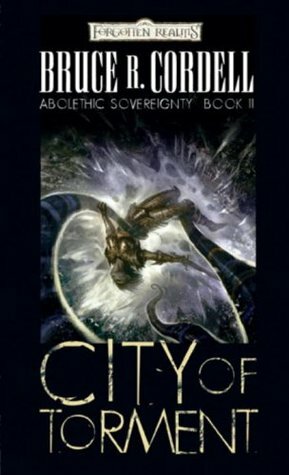 City of Torment: Abolethic Sovereignty, Book II is the second novel in the Abolethic Sovereignty trilogy by Bruce R. Cordell. The first is Plague of Spells: Abolethic Sovereignty, Book I and the third one, Key of Stars is to be released in November 2010. City of Torment (CoT) continues about a tenday after the conclusion of Plague of Spells (PoS). The main plot is a bit of the same as PoS except with the events that happened at the end of PoS, CoT takes on a more dangerous venture with a trip to City of Torment: Abolethic Sovereignty, Book II is the second novel in the Abolethic Sovereignty trilogy by Bruce R. Cordell. The first is Plague of Spells: Abolethic Sovereignty, Book I and the third one, Key of Stars is to be released in November 2010. City of Torment (CoT) continues about a tenday after the conclusion of Plague of Spells (PoS). The main plot is a bit of the same as PoS except with the events that happened at the end of PoS, CoT takes on a more dangerous venture with a trip to Xxiphu (pronounced Zee-Fu :) There are a few sub plots developing throughout such as Japheth's path to right a wrong no matter the consequences, Raidon's quest to abolish all aberrations, Seren's uncovered past, Thoster's unknown lineage, Anusha's plight, and a couple others that may lead to spoilers. I will have to say that I was impressed with the depth of Mr. Cordell gave his characters this time around. They all felt more natural and real. Each had their own voice and motivations. Their actions equally moved the plot as well as the plot moved their decisions and actions. For me, I feel that Raidon was the only main character that I really didn't care for as much. He is not a horrible character, but he felt a bit emotionless to me. I did connected much better with Thoster and Seren in this novel. I am really looking forward to delving more into their pasts and seeing how they develop more in the next book. Anusha was also a better character this time. Japheth started out ok. I wasn't as engaged with him at first as I was in PoS, but he did get better along the way and I did end up enjoying his character as much as before. There are also a couple other characters I did not care for, one was Behroun and the other Malyanna. They seemed to just pop in every not and then for no further reason than to move a plot point. Oh yeah, one other character that I enjoyed and continue to do so is Neifion. He adds a wonderful demonic feel to the book. I have a lot of fun reading his scenes. The book flows rather well. Each chapter gives the reader what is going on with the differing groups of characters and weaves them together nicely towards the end. The pacing is well balanced giving some breathing room before the action. Speaking of actioin, I feel that Mr. Cordell does for hand-to-hand combat what Mr. Salvatore does for fencing. The depictions are really good and easy to follow. 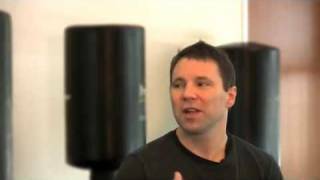 From every flex of the wrist to hop toss to swing kick is easily visualized. 1. I felt there could have been more feeling given to Raidon's character. I'm not sure if this was done on purpose because of traumatic events that happened in PoS and the influence that is felt with the presence of the sword Angul, but I wanted to care about his character more. 2. The few scenes with Behroun and Malyanna felt like they were just there to add a plot point or move a plot line further. The only thing that was really added to the story, to me, was the twist with one of the other characters, which I did like. 3. For as fearsome as the aboliths are built up to be, they seemed to be treated as just so much fodder in this book. I felt that I was being given the feeling of a group of monsters that were not to be trifled with and yet they seemed way too easy to kill. I would go more into detail with this, but I feel that it would spoil a plot point. 1. The characters this time around had a better feel to them. Where PoS was more plot establishment and development with character introductions, CoT was more character driven and so I enjoyed the characters more. Even some of the side characters begged for notice and were not forgotten. 2. The character development was more even and felt right. Anusha's character develops a bit more, but not at the excelled rate that she did in the first book. Most of the characters are more well rounded now. 3. Mr. Cordell still knows how to get his vision out there. He paints the canvas with words of color and vivid detail without over describing everything. As much as I enjoyed this novel, I would have liked to give it 5 stars, 4 1/2 for sure if that option was available, but I feel that Mr. Cordell has more he can give to shine brighter. PoS lets us know the consequences of the spell plague, and CoT just furthers those consequences. I'm really looking forward to Key of Stars. For people who want to get into the realms post spell plague and get a feel for 4E characters, I would definitely recommend this trilogy. If you are looking into trying the fantasy genre, this also would not be a bad start. Not as exciting as the first one, but then again, that is because I already knew the characters. There are a couple of twist behind them that show up in this one, and that does keep me hooked. I am kind of mad that I have to wait for the last, because it should answer a bunch of questions that continually get brought up. Was...okay. I liked the first book better than this one. Some of the events seemed to take place too quickly. Another fast paced D&D book. Definitely could feel the 4E vibe in it a bit, it sort of took me out of it, but retained most of the fun value. Genuinely interested in knowing how the story will end. Well written. A compelling and enjoyable story. On to book #3!! more of the same lovecraft in the forgotten realms , a bit of spelljammer thrown in to the mix , and did I spot a bit of the Elder scrolls as well ?